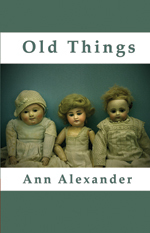 Ann Alexander's fourth collection of poetry has its roots in Cornwall, where she lived for 30 years with her daughter and her late husband. Many of the poems reflect the pain of loss, others the joy of birth. She has won several prizes, including the Frogmore Prize, Mslexia, Grey Hen and Bedford Open, and was placed third in the BBC's Poem for Britain. She worked as an advertising copywriter in London for many years, and recently moved to Stratford upon Avon.